No sooner had it started than it ended, with both kids having played baseball since mid-April here in merrie olde England for the second year. 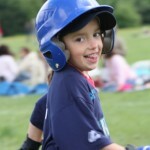 Scarlett played in T-Ball, with me as her assistant coach, though as the season progressed I spent more & more time with Miles’ team who needed someone who could pitch for batting practice. 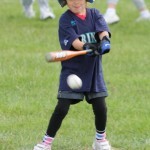 But anyway Scarlett was on the Mariners and played her little heart out. I’ll push her into coaches’ pitch next year (where the coaches pitch to the kids, rather than using a tee). She’s got great hand-eye coordination and is fast. Plus it’s really obvious that she likes playing as part of a team, which sometimes girls don’t get to do enough at her age, where quite often they play individual sports instead. Miles was playing for the Indians in what they call the minors, playing with boys who were all 1-2 years older than him, as he wasn’t officially old enough to be playing truly competitive baseball this year, but he did well enough in the trials to get in the team. 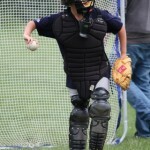 He started playing in the outfield and being catcher, which he liked, as you got to dress up in all the gear. 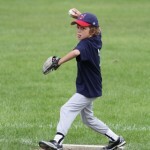 But eventually he was allowed to pitch and ended up as starting pitcher two weeks in a row, pitching three innings each time and doing really well. His batting improved as the year went on, as it did for all the kids, but it’s quite a different experience having Dad pitch to you so that you can hit it, and have a 9 or 10 year old boy – with all the inherent lack of control they have at that age – pitch to you so try and get you out, with a 17 year old umpire behind you calling the strikes. It was a good learning experience and the NY Mets bat he has ended up with two major dents in it, so we’ll be getting a new one of those at some point. Anyway click on any of these pictures for (slightly) larger versions, including ones without the heads cut off and there’s loads more higher quality ones here from the month of June.